CN Rail, the owner of the rail network in the eastern Canadian province, said the crash took place at 2:45 am on Saturday. No one was injured. Three roads near the community of Gogama, where the accident took place, have been sealed off for up to 36 hours. The $70-billion Canadian National Railway Company suffered its last derailment in nearby Horneypayne just two days earlier, though there was no chemical spillage in that crash. 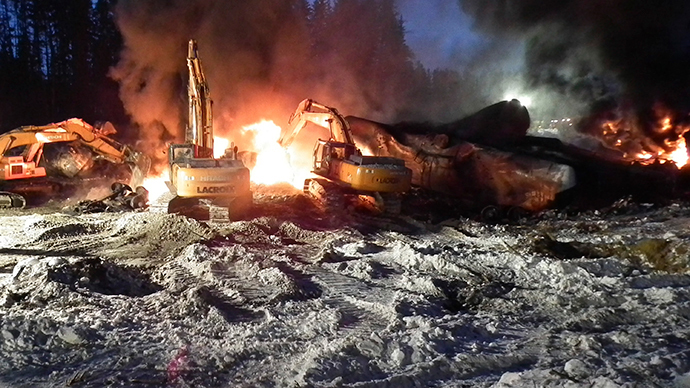 But a massive explosion, also in Gogama, just last month resulted in the spillage of more than 1 million liters of bitumen into the environment, after 15 carriage tanks were breached, following yet another derailment. The authorities said that the spill contaminated a nearby lake and pond, but insisted the toxicity levels were not threatening to humans or wildlife. Last year Canadian authorities instituted more stringent safety standards for rail cars carrying flammable liquids, and last month new rules increased insurance liabilities for companies transporting dangerous goods. The measures are a response primarily to the Luc-Megantic disaster of 2013, when an oil-laden train exploded after a derailment in an urban area in Quebec, causing the deaths of 47 people. The industry has resisted sweeping measures, which it says will force it to refit 50,000 train carriages in a decade, scuppering the oil-by-rail revolution that has taken place in the last half decade, caused by production expansion in Western Canada, and limits in pipeline capacity. Canadian train tracks are expected to carry 700,000 barrels of oil a day by next year, up from less than 300,000 in 2009.